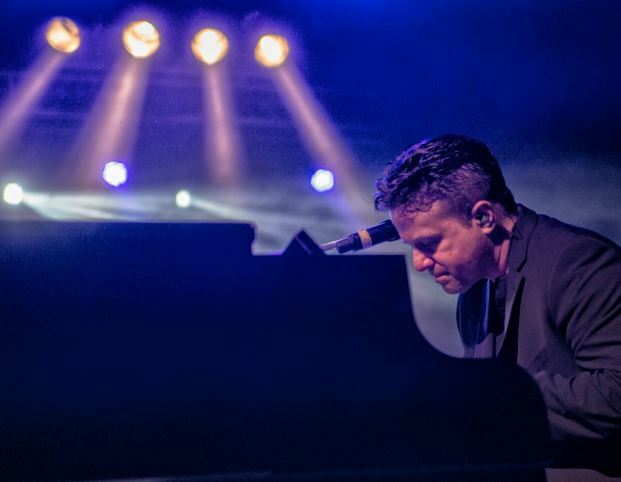 Interview with Mike Santoro of The Stranger: A Tribute to Billy Joel. Karina: Where did your love for Billy Joel begin? Mike: Growing up in suburbia, Levittown NY. I was about 10 years old, and my oldest sister (in her early teens) had great taste in music. I used to shuffle through her records and played The Stranger album beginning to end. When I learned that Billy Joel himself was born and raised just a few miles from me in Levittown, an instant hero was born in my world. Karina: How did you learn to play the piano? Mike: I was a self taught drummer, and always loved piano but never really took it seriously until I was in my 20’s. Everything I know is learned by ear and muscle memory. It’s been the most challenging and the most rewarding thing for me. Billy has compared the piano to “a big Drosendorf dog with 88 teeth trying to bite my fingers off”. I can’t agree with him more! Karina: What do you enjoy most about performing at historical theatres? Mike: If the walls can talk! When playing in a historical theatre, I feel like I am literally living and being a part of its history, which truly gives me a deep appreciation for having this so called “job” that very few get to do professionally. It’s really nothing short of an honor, and such a thrill that while it’s happening I couldn’t quite put it into words. Right now, joy is a good word. Karina: What is your favorite Billy Joel song to perform? Mike: I’d probably have to say “Scenes From An Italian Restaurant” because it’s his first “epic” song, it tells a story, it’s rich in both sound and meaning and it’s the most challenging to play. Plus our audiences always loves to hear it. Karina:What can the audience expect from the show? Mike: FUN. The guys in the band really enjoy each other’s company on and off stage and it shows and it’s contagious. We’re fellow fans with the audience celebrating the music of the Billy Joel, so it’s a musical and personal journey that we all relate to. By the end of the show everyone doesn’t want it to end, it’s that much fun. Making great memories. Karina: What are your fondest musical memories? Mike: Without having to think about it, being with my late father in his Oldsmobile listening to him sing along to the songs on his AM radio and he’s encouraging me to sing out loud. I was a shy kid, still am in many ways. But I credit my dad, who was also a professional singer once upon a time, for his inspiration. He was a phenomenal tenor, and sounded A LOT like Frank Sinatra. Karina:What advice would give to beginners who are nervous? Mike: I get nervous before every single show I’ve done to this day. It’s natural. Nerves are GREAT, and useful! So, I’d say to use that nervous energy, channel it, and turn it into your passion. Nothing great ever comes quick and easy. And it’s ok to make mistakes, just own it. Even someone like Billy Joel himself has had to fall many times in order to learn from his mistakes, and to have the drive to grow and cultivate his passion for songwriting and performing his music. And that’s why he is a legend, and why I get to do what I do.